If you have an urgent eye matter, please call our Shawnee Mission office (913) 362-3210 or our Overland Park office (913) 492-0021. Our staff and doctor will help assess the urgency of your situation and schedule an appointment appropriately. 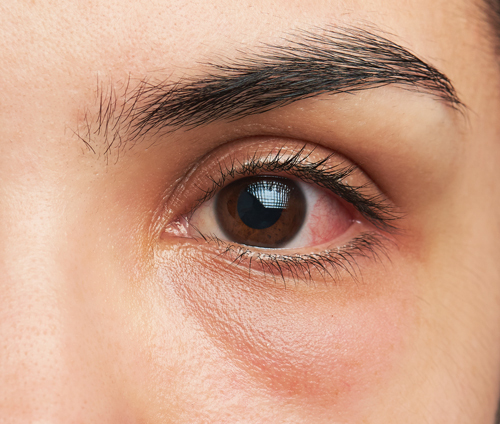 A red eye is a fundamental sign of inflammation with varying degrees of severity. The severity level can typically be identified through history of the red eye (onset, pain, discharge). Then through examination, our doctors will provide a diagnosis and treatment plan. Floaters are a common age-related eye problem. Floaters are tiny spots or strings that drift across your vision. They are usually noticeable in bright environments, particularly while driving. Floaters are usually due to age-related changes that occur as the vitreous (jelly-like substance inside eyes) becomes more liquid. Clumps can form and cast shadows on the retina when light enters the eye. Floaters can be distracting at first. They do not completely go away. But they tend to settle below the sight line which is less noticeable. The brain also adjusts to floaters and tends not to “see” them over time. Sometimes a prominent floater can be a posterior vitreous detachment. The vitreous gel pulls away from the retina. As this occurs, it can cause quick flashes of light in the periphery of vision. Most of the time, this does not cause any problems. 8-10% of symptomatic posterior vitreous detachments cause a retinal break. This break can eventually lead to a retinal detachment. If you have new floaters, especially if you also have light flashes or vision loss, call promptly for an appointment. A healthy retina is necessary for good vision. The retina is a thin layer of tissue that lines the back of the eye on the inside. The purpose of the retina is to receive that light, convert the light into neural signals, and send the signals to the brain for visual recognition. Retinal disease affects this vital tissue, sometimes affecting your vision to the point of causing blindness. Surgery is available for some retinal diseases, infections, and chronic inflammation of the eye interior. Depending on your condition, treatment may slow or stop the disease. Seek immediate medical attention from our doctors if any of these warning signs occur. What are the types of retinal disease? Retinal tear – Vitreous (clear gel-like substance) shrinks and tugs on the retina enough to cause a break in the tissue. This is often accompanied with an onset of floaters. Retinal detachment – Medical emergency in which the retina separates from the wall of the eye. 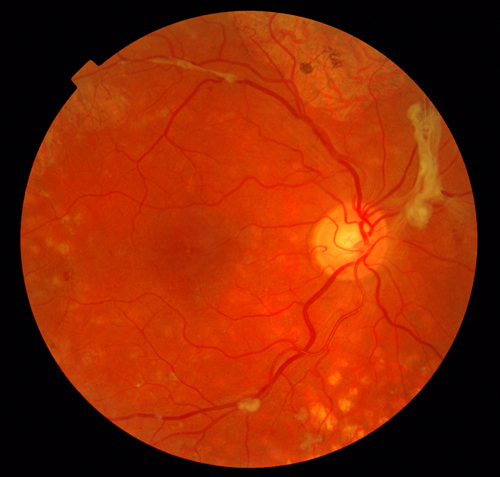 Retinopathy – Systemic disease, such as high blood pressure and diabetes, can lead to problems within the retina. Macular pucker – Scar tissue forms on the macula. Macular hole – Small defect in the macula which may develop from abnormal traction between the retina and vitreous or result from eye injury. Macular degeneration – Retinal degenerative disease that causes a progressive loss of central vision. The main treatment goal is to slow or stop disease progression and improve or restore vision. Often, whatever damage has already occurred cannot be reversed so early detection is important. Sometimes treatment is an emergency. Heart of America doctors will direct you to a retina specialist, if necessary, for treatment which may include injections and/or surgeries. Heart of America Eye Care doctors can determine if you have retinal disease. Diabetic eye disease is a complication of diabetes that can lead to blindness. The most common form is diabetic retinopathy which occurs when high blood sugar levels cause damage to the tiny blood vessels in the retina. These blood vessels can swell and leak or conversely they can close which inhibits blood from passing. Sometimes abnormal blood vessels can grow in the retina. Early detection and treatment of diabetic retinopathy can reduce the risk of blindness. Early detection is critical since vision lost to diabetic retinopathy can be irreversible. An annual comprehensive dilated eye exam is the key to early detection. We may recommend more frequent exams based on the severity of your condition. Diabetic females who become pregnant should also schedule a comprehensive eye exam. Studies show that controlling blood pressure, cholesterol, and blood glucose levels will aid vision health. Sometimes if retinopathy is found and the patient is committed to improving blood glucose levels, observation is all that is needed. Should you need treatment, our eye doctors will refer you to a retina specialist. Anti-VEGF Injection Therapy – Anti-vascular drugs are injected into the vitreous gel to block a protein called vascular endothelial growth factor which reduces the growth of abnormal blood cells. This also helps reduce swelling of the macula which slows vision loss. Panretinal Laser Surgery – Small laser burns are made to leaking blood vessels in areas of the edema near the center of the macula to slow the fluid leakage and reduce swelling in the retina. Sometimes this treatment requires 2 or more sessions. Vitrectomy – For advanced proliferative disease (PDR), surgical removal of the vitreous gel and blood from leaking vessels in the back of the eye may be needed. Scar tissue might also be removed from the retina during this procedure. Heart of America Eye Care doctors can determine if you have diabetic retinopathy. AMD is the most common cause of irreversible blindness in the Western world. It is a disease associated with aging that gradually destroys sharp, central vision. The macula is the center of the retina, and it is responsible for central vision. It is what we use to see fine details. In macular degeneration, this important part of the retina starts to degenerate. As its name implies, age is a major risk factor for developing AMD. Ten percent of people between the ages of 66 to 74 years will have signs of AMD versus about 30% between the ages of 75 to 85 years. About 20% of those with dry AMD progress to wet, which is more damaging, progresses faster, and results in greater vision problems. In the wet form, there is a growth of abnormal blood vessels from the choroid (vascular layer of eye between retina and sclera) underneath the macula. Symptoms include distorted vision, dark grey or blank spots, loss of central vision, and/or differing size and color of objects per eye. Our doctors will recommend a retinal consultation to receive treatment such as injections of anti-VEGF medication to help slow the progression of the disease. In most cases, AMD cannot be treated, although studies have shown that the antioxidant supplements lutein, zeaxanthin, and zinc play a role in preventing advancement. Here is the good news – a lot of AMD research is being conducted and better treatments are always emerging. Heart of America Eye Care doctors can determine if you have macular degeneration.